Get creative together! Drop in for an afternoon adventure in the new Hood. 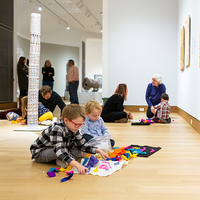 Try in-gallery activities, explore the museum on your own with a family guide, and create your own artworks to take home. For children ages 4 to 12 with adult companions. At 1:30pm, there will be a special performance by the Swing Peepers, a vocal-harmony and multi-instrument duo that performs inventive, earth-friendly, and interactive songs and stories. No registration is required. For more information, call (603) 646-1469.